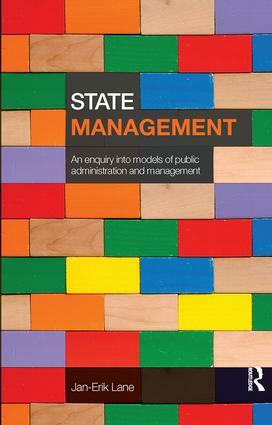 State Management offers a comprehensive yet concise introduction to the new field of state management, presenting an analysis of basic questions within the theories of bureaucracy, policy-making, principal-agent modelling and policy networks. Focussing upon recent state transformation, it illuminates public sector reform strategies such as New Public Management as well as incorporation, tendering and bidding, decentralization, team production and privatization. This book argues that we should look upon the variety of models or approaches to public management or public administration as all belonging under "state management". The so-called "working state" in a well-ordered society involves government delivering services, paying for social security and respecting the rule of law. In this text, Jan-Erik Lane systematically examines the key approaches to the study of how government attempts to achieve these goals, discussing the pros and cons of alternative frameworks of analysis. Presenting a clear overview of how the state operates when government sets out to deliver public services, and generating questions to encourage new research, State Management is a valuable new text for both undergraduate and postgraduate courses in political science, public administration and public management. Introduction: Is public management different from private sector management? Policy models: How rational is public management? Marketisation models: How much should government use internal markets and public procurement? Ecology and policy: How to combine the two? The comparative challenge: Are there different state models?